This novel is the seventh in a mystery series focused on an English professor turned amateur sleuth, written by Joanne Dobson, herself a noted English professor and literary scholar. The series began with Quieter Than Sleep, Dr. Dobson’s debut novel featuring her heroine, Professor Karen Pelletier, a woman from the wrong side of the tracks who had fought hard to work her way to a position in a prestigious private university. Karen is a likable, down-to-earth, motherly figure that the reader can easily get behind in this first-person “cozy” (meaning a mystery novel featuring an amateur detective that shies away from graphic violence). I had found the Karen Pelletier series quite by accident, picking up the first in the series at a used book sale because it promised to be ‘a mystery of Emily Dickinson’; I quickly fell in love with the series, its heroine, the grumpy policeman love interest, the charming characters and even the sometimes stuffy fictional Enfield College. Each ensuing novel seemed only to get better, though the sixth definitely left something to be desired – but I’ll get to that in another post. Dobson returned to form with her seventh in the series. Our beloved Prof. Pelletier is up for tenure at Enfield College while being left to face the stress of the matter alone, with her daughter backpacking through Asia and her love interest, the oddly charming grump Lietenant Piotrowski, away serving with the National Guard in the Middle East. This sets the tone for what is missing from this novel to a grand degree – the likable friends, students and colleagues that had filled the series with their happy presence from the first in the series are scant, a big change from the usual format of the novel. Also missing, to my great disappointment, is the academic aspect that had speckled the Karen Pelletier novels from the very beginning. From Emily Dickinson to Edgar Allan Poe, to a fictional roman à clef that mirrored the real-life Peyton Place, Dr. Dobson’s novels have always had an accompanying literary mystery that went hand-in-hand with the modern murder the crafty English professor heroine was trying to solve. Not so with the latest entry in the series, which focuses solely on the murder at hand. 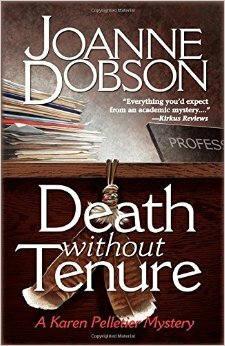 That being said, Dr. Dobson’s mystery is still a step above many others in the “cozy” genre, touching on class, gender and religious divisions among her students, the Enfield staff and even her own family while spinning a tale of secrecy and murder. While I’d love to see more of Karen’s “old friends” in the next in the series, even if Dr. Dobson continues on course with her current style, it will be worth the read.